Protect your property rights and assets with properly drafted prenuptial and postnuptial agreements. Angotti & Straface Attorneys at Law L.C. have been assisting residents in Morgantown, WV, with safeguarding their assets since 1952. Our attorneys work closely with each client to determine the best proactive strategy, which includes drafting, negotiating, and reviewing pre and postnuptial agreements, to ensure that the financial security that you have worked hard to earn is protected in worst case scenarios such as death, divorce, and separation. Absent a binding agreement in these circumstances, your assets will be distributed according to laws which may violate your wishes and leave your assets open to seizure. Our law firm has over 66 years of experience handling marital agreements, divorces, and other family law-related matters. In that time, we have witnessed horrible injustices regarding redistribution of property, wealth, children from previous marriages, family inheritances, lost heirlooms, etc. You have a right to protect what you earned, as well as the interests of you and your children. While some regard marital agreements as impediments to the joyous aspects of marriage, this reputation is unjustified, as marital agreements are actually protective documents. It is important to ensure that you are entering into such a structured legal agreement fully protected. 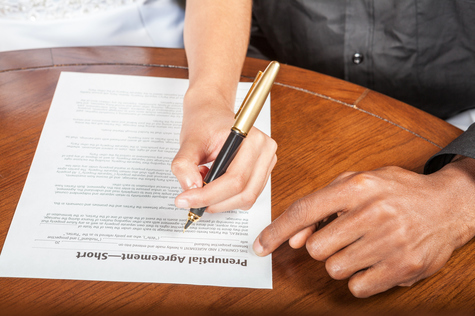 Marital documents protect the surviving spouse if one dies, as well as in the case of divorce or separation. Over half of all marriages end in divorce. None of those spouses entered into marriage thinking that divorce would be the outcome. It is our firm belief that most prospective spouses should have a premarital agreement drafted before walking down the aisle. A postnuptial agreement may also be drawn up during the marriage to ensure that both spouses are fully informed in order to help prevent potential discord, avoid conflict, and help protect the marriage. We will personally meet with you to discuss whether a premarital or postnuptial agreement is right for you. Prenuptial agreements can benefit both partners and help ensure that assets are, in fact, distributed fairly if divorce becomes reality. We can help safeguard assets that you have accumulated or earned prior to your marriage. Postnuptial agreements serve the same purpose as prenuptial agreements. However, they are drafted during the marriage. If financial concerns are an issue of contention in your marriage, a postnuptial agreement can help clarify the stressful money matters that many couples struggle to deal with. Financial disagreements are cited as one of the most common underlying causes for divorce. When both spouses sit down and work out issues such as the family budget, which assets belong to which spouse and which are marital assets, the financial status of any businesses owned, and even day-to-day matters such as how each spouse is expected to contribute to the marriage, who is allowed to visit and stay at the family home, etc., marriages tend to be happier because both parties know exactly where they stand and what to expect. Ideally, these matters should be clarified prior to marriage. However, most couples fail to discuss these issues, as many are simply not predictable. It is never too late to work out the details to preserve peace in your marriage. Contact Angotti & Straface Attorneys at Law in Morgantown for a free initial consultation to discuss how we can help protect your interests with a prenuptial or postnuptial agreement: (304) 292-4381.